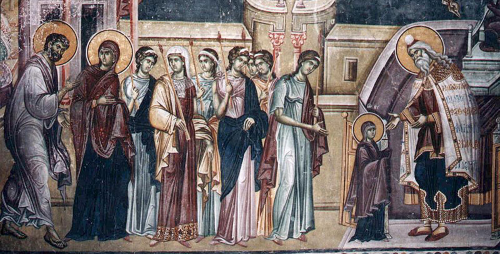 The Entrance of the Theotokos into the Temple, also called The Presentation, is one of the Great Feasts of the Orthodox Church, celebrated on November 21. Among those Orthodox Christians who use the "Old" (Julian) calendar as their Church calendar, the date of this feast corresponds to December 4 in the secular calendar. Mary was solemnly received by the temple community which was headed by the priest Zacharias, the father of John the Baptist. She was led to the holy place to become herself the "holy of holies" of God, the living sanctuary and temple of the Divine child who was to be born in her. The Church also sees this feast as a feast which marks the end of the physical temple in Jerusalem as the dwelling place of God. Liturgy begins at 6:30pm for this important feast day. The Christmas fasting period runs from November 15 to December 24. Guidelines for proper fasting during the Christmas fast can be found on the Antiochian Archdiocese website. Look at the schedule, conform to the fast as you are able, and if you have questions consult Fr. Hans. Every Christmas season St. Peter's runs a food drive for NAMI (National Association for Mental Illness)serving local people in need. NAMI helps people with serious and persistent mental illnesses, as well as their parents, children, spouses, siblings and friends. The Women's Group meeting schedule for Thursday, November 17 is CANCELLED. 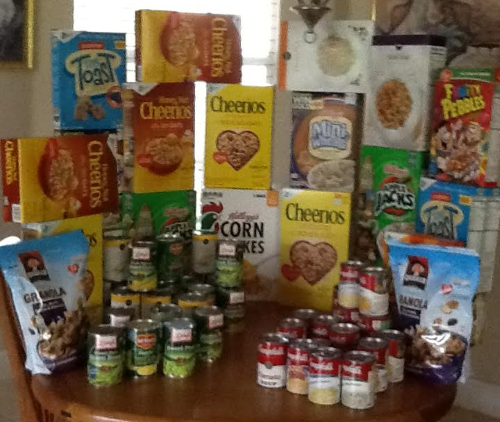 On behalf of ICSL, I want to thank you for the 734.5 pounds of food that you donated so far this year. That is simply amazing! We continue to focus on ending hunger in our community. Your donation will help to make that easier. As the need in our community for basic items such as food and shelter continue to be an issue, people like you make a great impact. We are blessed to have your support! As we enter into the new Ecclesiastical Year, St. Peter's will hold at least one monthly parish social event. Please mark you calendars. Choir practice this Tuesday, November 15, 2016. Bible study also this Wednesday, November 16, 2016 at 7pm..
Do not judge others, for this alone will intercede for us during any judgement before God. Watch, therefore, for you know not on what day your Lord cometh. Adam, God's first-formed man, transgressed: could He[God] not at once have brought death upon him? But see what the Lord does, in His great love towards man. He casts him out from Paradise, for because of sin he was unworthy to live there; but He puts him to dwell over against Paradise: that seeing whence he had fallen, and from what and into what a state he was brought down, he might afterwards be saved by repentance. Prayer must arise from repentance, contrition, and above all, humility. Thou, O Lord, shalt preserve us and keep us from this generation. Save me, O Lord, for the godly man hath disappeared.